When they heard John say this, they followed Jesus. In her sermon last Sunday, Caroline Hall reflected on this reading from John’s Gospel. She reminded us that – just like Andrew and Peter – we begin to be disciples when we begin to spend time with Jesus, building a relationship with his Spirit, a relationship which leads us to the living God. There are so many ways to build a relationship with God, but one way is the time we spend together in worship. In a practice that goes back in time at least 2,500 years, people seeking God have come together to sit in silence to hear the words of Torah/Bible, and then respond to the Word through songs and prayers that also come from Scripture. And so the Jews of Jesus’ time gathered weekly in their synagogues to hear, sing and reflect on the sacred scriptures. 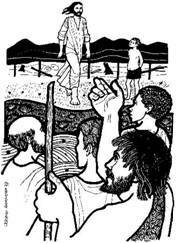 Imagine Jesus as a little boy, sitting with his family in the synagogue, listening to the words of the prophet Isaiah: The people who walked in darkness have seen a great light; those who lived in a land of deep darkness – on them light has shined. What could those words of Scripture have meant to Jesus? Like Jesus, like his family, like their ancestors and descendants, we are surrounded by Scriptures every week when we gather for worship. And if we listen, the Holy Spirit will speak to us through the Scriptures we hear. So – what do you hear in this passage from Isaiah? And – what do you imagine when you hear Isaiah’s words set to music? In this passage from Isaiah, the prophet gives us a picture of how God imagines life for the people who live on our planet: God imagines a place of justice, a place of hope, a place of light and life. Whenever the Scriptures are read, we need to open our ears and our hearts to what God imagines for us. Yesterday I spent some time with a friend who has gone through one back surgery after another as rheumatoid arthritis has attacked her spine. The latest surgery – two weeks ago now – left a scar from just below her neck to the base of her spine. She is in so much pain, she is so tired, she is so hoping that this will be her last surgery. This morning another friend is with her, and they are saying Morning Prayer together. They’re saying the same psalm we have just chanted (Psalm 27). What do you feel when you say this psalm? To behold the fair beauty of God and to seek God in the temple. hide me in the secrecy of a dwelling, and set me high upon a rock. Even now God lifts my head up above my enemies round about me. I will sing and make music to God. Your face, God, will I seek. Hide not your face from me, nor turn away your servant in displeasure. What are your deepest fears, your greatest hopes? What does the Spirit tell you God wants for you and your life? What is your prayer for those you love, who are in pain and afraid, yet still hope for God’s comfort and healing? And what do you hear in today’s Gospel? At the moment we begin to listen, we begin to become disciples. If we love someone dearly, we want to listen to them. And yet I’m discovering, after all these years of knowing and loving my husband, that sometimes I don’t listen to him. Maybe his voice is so familiar it seems part of the background of my life; or, I’m so sure I know what he’s going to say that I don’t listen. I’m learning to stop and ask him, “Would you say that again from the beginning? I wasn’t listening…” And if I really listen, sometimes I hear something new. After all these years of hearing the Scriptures on Sunday mornings, sometimes I don’t listen. Maybe they’re so familiar they’ve become part of the background of my life; or, I’m so sure I know what they mean that I don’t think I need to listen. And if I really listen, I often hear something new. If we really listened to the Scriptures, what would we hear? And what would we do? 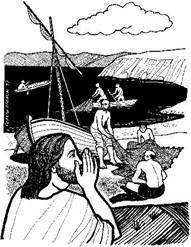 Immediately they left their nets and followed Jesus.